We're in the last few days of voting for the Military Fatherhood Award! Make sure you vote everyday for your favorite finalist! Each dad has great stories and we are grateful for their service to our country. Even if you're not in the military, you can be inspired in practical ways by our Military Fatherhood Award finalists. 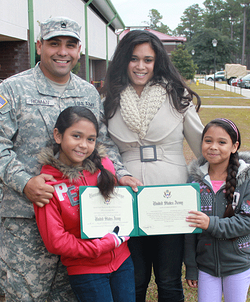 This week, we're featuring SSgt Jorge Roman. The Roman family enjoys being outside, and Ssgt Roman is always looking for opportunities to teach his daughters about nature, bugs, and plants. He also shares his love for art with his daughters by painting and making crafts with them. A great way for you to bond with your kids is to share your interests and look for teachable moments in the daily activities of life. Ssgt Roman and his wife tuck the girls into bed every night by reading a story or singing a song together. Even when he was deployed, he joined the family for bedtime by telephone as often as he could. Depending on the age of your children, a bedtime story might not be your family's evening routine. And, there will be days when you have to discipline your children or when your teens want to assert their independence. However, make a commitment to end every day on a positive note with your family. Ssgt Roman turns his phone on silent or off during dinner and other family times. The family knows that sometimes he has to answer the call of duty, but he is committed to not letting work interrupt his time with his family. Check out NFI's tips on how to turn off your phone and establish balance between work and family. One of Ssgt Roman's colleagues in the Army is a single mom with four children. Ssgt Roman brings her kids home from school when he picks up his daughters, invites the children to play with his kids, and tosses a ball around with the son. He makes an effort to be a positive male role model for these children. NFI calls this being a Double Duty Dad. You probably know kids whose dads are not as involved or are absent from their lives and can be a positive influence in their life in simple but profound ways. Ssgt Roman is a first generation American. He didn't grow up with a lot of money. He is passing on the "American dream" to his daughters with the emphasis not on material things but on spending time as a family and instilling good values. As a dad, know that your relationship with your family is the real legacy you pass on.